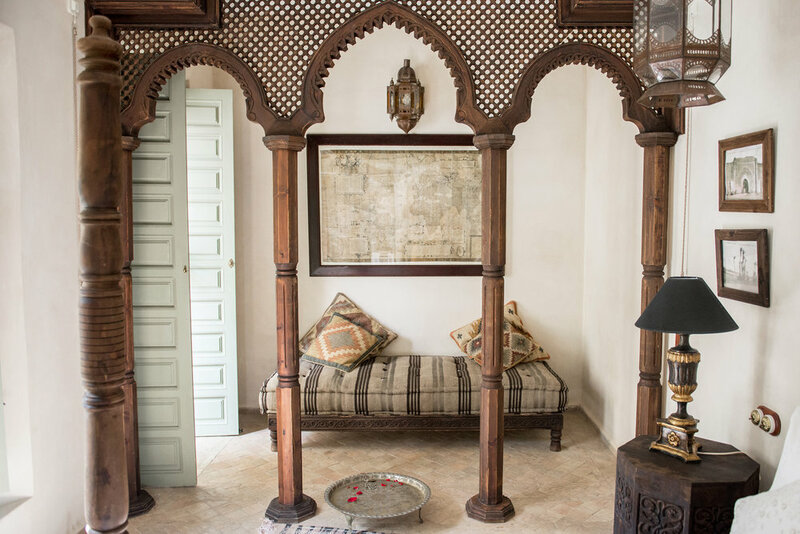 Located within the heart of the Marrakech medina, The Palacio de las Especias is a stunning 19th Century home, beautifully restored into a 7 room guesthouse by owners Jose and Higinio. Once owned by a family of spice merchants, the building was updated with all the modern comforts while maintaining the original architecture to respect its historical past. With cool patios, a courtyard pool and fountains, and a rooftop terrace, this chic retreat is the ultimate hideaway of relaxation and tranquility. The 7 rooms are named after 7 of the gates in the medina and all have unique, decorative characteristics from the ancient copper bath in Bab Doukkala to the latticework of Bab Debbagh and Bab El Khemish. Some rooms have a balcony overlooking the fountain on the reception patio and a sitting area thats perfect for drinking a cup of mint tea while others have doors that open onto the central courtyard, with a charming Rajasthani-style tea corner and a traditional hammam Arab bath in the bathroom. The chef Jamila, fuses the flavors of traditional Moroccan cuisine with Mediterranean scents taken from desert gastronomy , perfectly combining spices with meats, pastries. We recommend the gourmet menu where you can taste delicate briouats, incredible tagines, the traditional pastela or desert dishes like hummus. Fresh pastries and a European buffet including fresh pastries are served for breakfast. The Riad is only a 10-minute walk from the famous Marrakech Souks and other places of interest as important as Medersa Ben Youssef, the Museum of Marrakech, the Koubba Almoravid or the Dar El Bacha Palace, among others, or a 15-minute walk from Jmaa El Fna Square. The Riad has a taxi rank at only 200 mts. from the door. It is approximately a 20-minute drive from Marrakech-Menara Airport. Rates for double room start at $100 per night (+ local taxes), including breakfast. In order to preserve the spirit of tranquility and relaxation of the riad, only children over thirteen years old are permitted to stay. The Riad is in the heart of Marrakech's old medina where you can find the famous Marrakech Souks and other places of interest, such as Medersa Ben Youssef, the Museum of Marrakech, the Koubba Almoravid, the Dar El Bacha Palace, Jmaa El Fna Square, Majorelle gardens and a lot of delisious restaurants and traditional hammans. Staff at El Palacio de Las Especias can organise day trips to the Ourika Valley, the coastal, UNESCO World Heritage town of Essaouira and the impressive waterfalls 150km north of Marrakech, Cascades dOuzoud. Within the riad itself guests can also sign up for Moroccan cookery lessons and yoga, among other activities.